Colorado Ballet's Dana Benton as Dorothy. Kate Rolston, Courtesy Colorado Ballet. Picture The Wizard of Oz, and your head probably fills with yellow brick roads, flying monkeys, emerald cities and ruby slippers. Now imagine what it takes to translate that magic to the stage—and what it would look like in pointe shoes. On Friday, Colorado Ballet will present the company premiere of Septime Webre's The Wizard of Oz, a ballet they produced jointly with Kansas City Ballet and Royal Winnipeg Ballet (KCB presented the world premiere back in October, and RWB will have their turn this May). The three companies split the costs of creating the full-length story ballet, which includes an original score by Matthew Pierce; 120 colorful costumes (plus 112 hats!) designed by Liz Vandal; projection technology and flying effects; and puppetry (including a puppet Toto) by Nicholas Mahon, who recently worked on the opening ceremony for the 2018 Winter Olympics. The result is a major new production none of the companies likely would have been able to pull off on their own. Putting together all the elements of the ballet was a huge undertaking that began nearly two years ago. 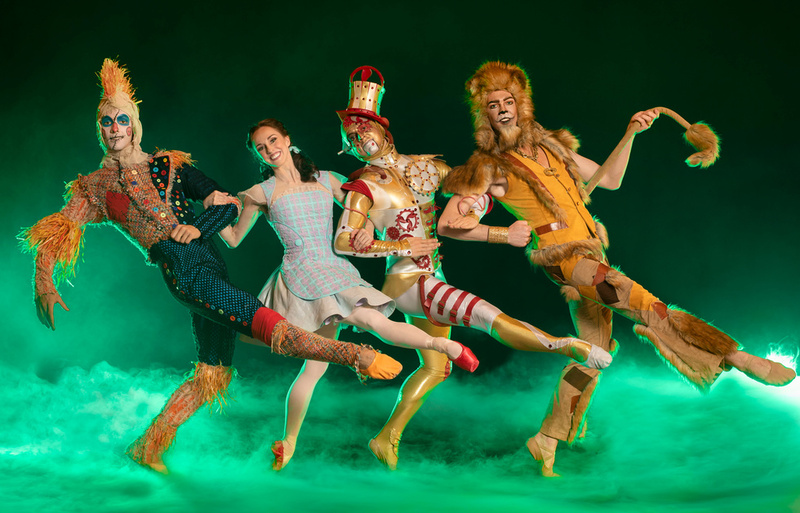 In February 2016, while setting his Alice (in wonderland) on Colorado Ballet, Webre approached artistic director Gil Boggs about creating a full-length Wizard of Oz. The beloved book by L. Frank Baum had just become part of the public domain (meaning it's fair game for anyone to use without paying royalties), and Webre had been dreaming of turning it into a ballet for years. Boggs liked the idea, but they knew they'd need three or four companies on board in order to share the financial burden of such a big production. Enter Kansas City Ballet and Royal Winnipeg Ballet. With three companies in two different U.S. states, plus Canada, figuring out the best way to set up the partnership was the first challenge. As for splitting the costs three ways, the differences in value between the U.S. and Canadian dollars added another hurdle. For Royal Winnipeg Ballet, "If we were putting in a dollar, they were having to put in about 1.20 Canadian," says Mark Chase, CB's managing director. In the end, a couple of CB's board members who are lawyers suggested the three companies set up an LLC—one entity that they could use to handle all payments and contracts with the various vendors and designers they would hire for the show. To offset the currency differences, a large percentage of the costumes and sets were constructed at RWB's facilities in Canada, which became part of their contribution. Because Webre's storyline hewed more to the 1939 film of The WIzard of Oz than to the book, the companies also had to contact Warner Brothers, which owns the rights to the movie. "We worked with their attorneys to come up with a shopping list of elements from the movie that we wanted to incorporate into the ballet," says Chase. "Then we pay them a royalty for the right to use those elements." For instance, the famed ruby slippers Dorothy wears in the movie are not in the book (originally, her shoes are silver). As the ballet came together, the three directors were in constant communication. "We had a standing phone call every Friday," says Boggs, "where the three companies would be discussing the budget, proposal, design costs." They also communicated every few weeks with Webre and their designers, going over photos in shared Dropbox folders and exchanging ideas. Webre choreographed several scenes on each company, so all three were an integral part of the creation process. "We all have our DNA in it," says Boggs. As for the way audiences are responding, CB is already seeing huge results in the leadup to their performances this week. "We're going to do over a million dollars in revenue on ticket sales for this," says Boggs, "which is the first time a production has done that for us, besides our Nutcracker." Introducing a new ballet has helped the three partner companies gain wider recognition and exposure, and they will likely continue profiting from the endeavor. Other companies have already expressed interest in performing the ballet themselves, which will mean renting out the sets and costumes. For smaller, more regional companies in particular, the chance to have new work set on them, and to produce something of this scale, is often all too infrequent. "For one company to take on the risk and all the expense of putting on a new ballet is pretty burdensome, especially because most companies need to be very careful of their costs whenever they can," says Chase. "I see this as a model going forward." While he acknowledges that multiple directors working on one project might add complication, it's also triple the resources and creative brainpower. "You could argue that more people contributing to the final product is actually better," he says. "The process for the most part was very smooth between the three companies," says Boggs. "I think we're all very pleased with the relationships we have with each other and the way the production has turned out. It's been a good adventure."